Jalbert is a Redguard necromancer hiding in the Ayleid ruin of Vilverin. He was exiled from his native Daggerfall for practicing Necromancy. While grave robbing, Jalbert was discovered by a friend in the Guard, a Captain Aluc Cardius, forcing the former to flee Daggerfall. He spends all of his time in Vilverin Sel Sancremathi, never even sleeping, despite the presence of a bedroll. Because of his high Aggression, he is almost always hostile and will attack you on sight. 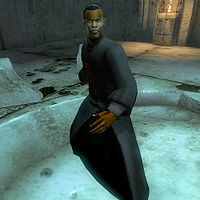 In addition to standard necromancer's robes, he possesses some relatively rare apparel: a dark shirt, black wide pants, and even leather bracers. He also wears cowhide shoes and a copper ring. He has a good chance (75%) of carrying a leveled poison. He is armed with a leveled dagger and sometimes a leveled staff (75% chance). In addition to these weapons, he can also rely on a set of leveled necromancer spells. In his new home he has penned an Undelivered Letter to Aluc Cardius apologizing to him and thanking him. In the chamber you will also find a sacred lotus flower, some sacred lotus seeds, a mortar and pestle, two lockpicks, nine gold coins, an Ayleid reliquary, a sack and a bedroll in which you can sleep. The Vilverin Sepulcher key sits in front on the reliquary. A fine iron longsword and shield lay next to a skeleton on one of the slabs. It is implied that Aluc Cardius is a vampire, and it can be noted that his name is similar to 'Alucard-ius', i.e. Dracula spelled backwards with an Imperial suffix.